Sundowns were totally dominant in the first half, starting like a house on fire and kept up that intensity for the entire 45 minutes, fashioning 11 goal attempts to Antlers’ zero, but without anything to show. Antlers goalkeeper Hitoshi Sogahata produced three world-class saves to keep out Thapelo Morena, Tiyani Mabunda and Percy Tau as The Brazilians completely dominated every aspect of the first half, with 56% overall possession. Khama Billiat caused a problem for Antlers as early as seven minutes into the match when he outmuscled a defender to get into the box, to the byline, but could not find Leonardo Castro for the finish. Just moments later Billiat slipped in Thapelo Morena on a marauding run inside but his shot was palmed away by Sogahata. Just before the half-hour mark Tebogo Langerman hit a long-ball towards Tau, who turned his marker brilliantly and went clean through on goal but saw his shot tipped away by Sogahata. Billiat should have done better two minutes later when Langerman crossed to the far post but the Zimbabwean, unmarked at the back post, could not keep the finish down. Sogahata was in the way again in the 35th minute when Tiyani Mabunda sent a show arrowing towards the top corner, but the Antlers shot-stopper flung himself to his right to make yet another brilliant stop. In the second half Pitso Mosimane’s side were unable to maintain the same intensity as the first 45 minutes as Antlers grew in confidence and started to stamp their mark on proceedings. 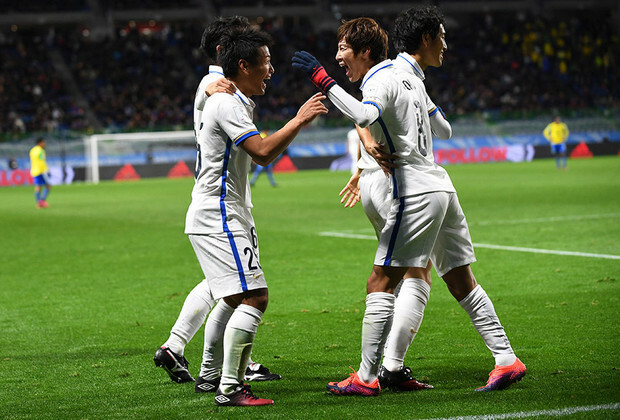 After looking dangerous on two occasions, the second of which needed Wayne Arendse to head a shot off the line, the Japanese side took the lead in the 63rd minute. Antlers got in behind the Sundowns defence as Denis Onyango came out of his goal and forced the first player wide, but after scrambling back to defend the cross, when the shot came back straight at him he was off balance and horribly fumbled on the goal-line, pushing the ball into his own net. Kashima’s heads were up after the goal as they contained the Sundowns attack with quick and high pressing as Pitso Mosimane threw on Siyanda Zwane, Anthony Laffor and Sibusiso Vilakazi in place of Thapelo Morena, Leonardo Castro and Khama Billiat. But as Sundowns pushed bodies forward, a very organised Antlers team punished them with a second goal, substitute Mu Kanazaki receiving the ball in the area from Endo and sending a cool finish past Onyango to seal the result. Sundowns will now play in the 5th/6th place playoff against Korean side Jeonbuk Hyundai on Wednesday, 14 December. Kick-off is at 09h30 SA time.